A short walk from the Duomo, Piazza Fontana is one of the prettiest squares in Milan’s center, a quiet respite from the hubbub of nearby Piazza della Scala and Piazza del Duomo. The piazza is named for its 18th-century neoclassical central fountain, designed by Giuseppe Piermarini and is encircled by trees and benches. Milan is known for its urban hustle and bustle, but there are a number peaceful corners of the city worth exploring. If you need a few minutes to regroup during your walking or Segway tour of Milan's most famous sights like the Cathedral (Duomo) and Sforza Castle, take a quick detour to this lovely square where the pace is slower and the crowds thinner. The square is a short walk from the Duomo and there is a wide pedestrian area encircling the center fountain, so perfect for cooling off in the shade for a few minutes with kids. There is a high curb around the central fountain area that may be hard to manage with a wheelchair or stroller. There are a number of cafés along the outside of the square that serve snacks and coffee. Piazza Fontana is located just behind Milan’s Duomo, less than a 5-minute walk from the Piazza del Duomo. The central fountain in Piazza Fontana has a number of water jets that are street level, ideal for cooling off hands and feet on a hot summer day. 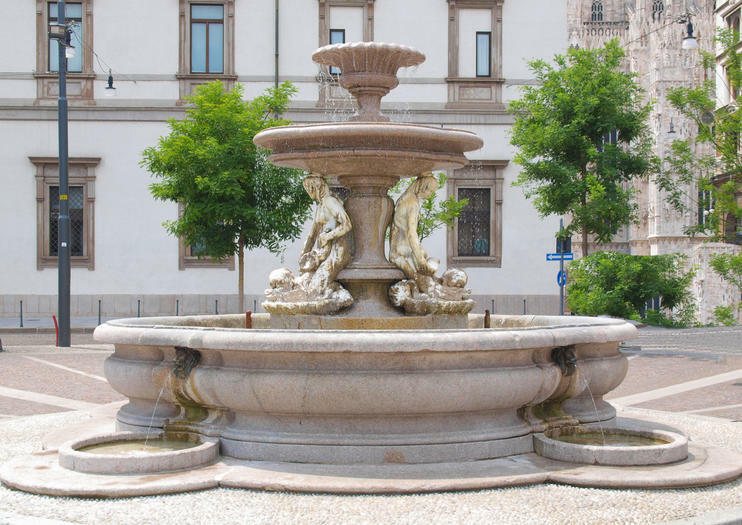 Piazza Fontana has a violent history that belies its peaceful atmosphere. In 1969, the square was the site of the bombing of the National Agrarian Bank, a domestic terrorist attack that resulted in 17 people killed and scores more injured. A plaque stands in the square in their honor. Cruise gennem gaderne i Milano på denne tre timers guidede Segway-tur i en af Italiens mest populære byer. Når du har mestret den selvbalancerende, tohjulede maskine, skal du tage afsted og udforske landemærkerne i denne mode og handel kapital. Din guide tager dig forbi slottet Sforzesco, Piazza del Duomo og La Scala operahuset. Og du får endda en chance for at strække sig ud på den øverste gade for at shoppe, da du gør din vej ned Corso Vittorio Emanuele II. Med en cap på otte personer, er denne Segway tour garanteret at tilbyde en personlig oplevelse til rejsende, der ønsker at udforske Milano.